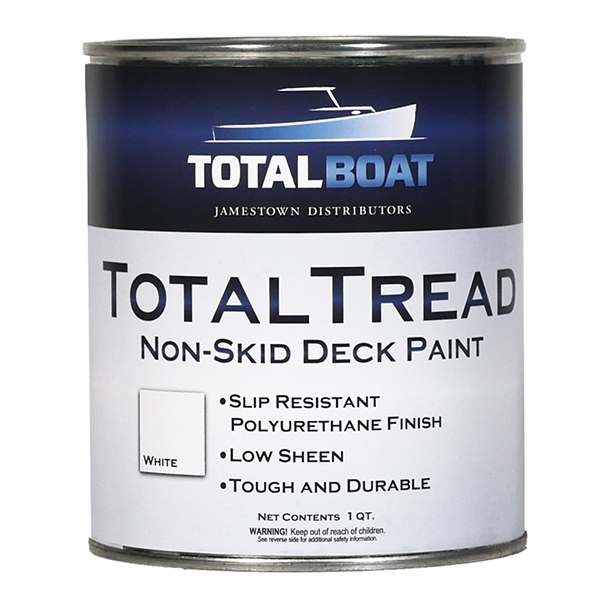 Unique non-skid deck paint creates a high-traction surface that's less abrasive and more durable compared to traditional silica additives. This one-part polyurethane's low-glare finish lasts longer and looks better than what you've been using. The amount of texture is determined by the number of coats applied. More coats equals greater texture. Apply over fiberglass, wood, and previously painted surfaces in good condition. Not for use on metals. Colors: Available in White, Kingston Gray, and Sand Beige. 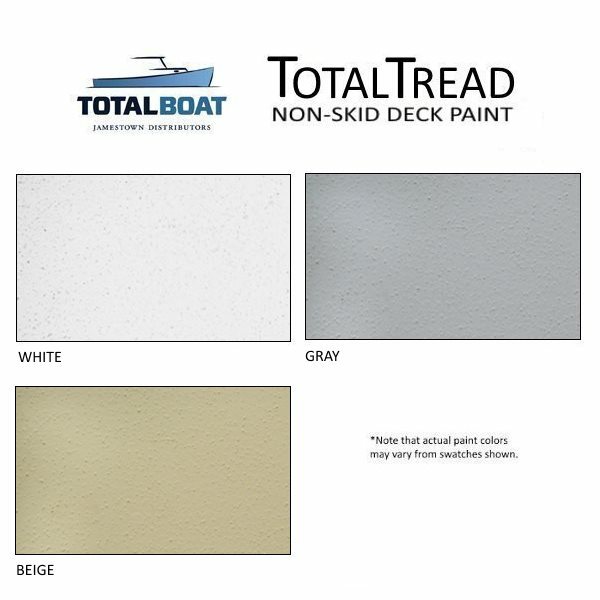 These match our TotalBoat Wet Edge Topside Paint colors White, Kingston Gray, and Sand Beige. Particle size matters. The round Propyltex™ particles in TotalTread are less abrasive than traditional silica, but more abrasion resistant. They come in a range of sizes, each with a different purpose. Some make sure the coating grips and lasts. Others lower the gloss level to prevent eye-straining sun glare on a wet deck. Some create a smooth feel underfoot. It doesn’t hurt to walk barefoot on it, and if you do hit the deck it won’t hurt nearly as much as old fashioned ‘sand’ non-skid additives do. The non-skid stuff in TotalTread has a low density so it stays suspended in the paint. Unlike other non-skid paints, the particles won’t float to the top, or sink to the bottom. Mixing is easy and quick, and doesn’t require a trip to the local paint store to have them give it a ride on the shaker for you. Because the particles stay suspended in the paint, it’s easy to lay down an even coat of consistent texture. You don’t have to keep stirring the paint to keep the particles in play. The most time-consuming painting task is masking off areas where you don’t want TotalTread. High-solids TotalTread will cover completely in one coat. However, we recommend two coats to get the best combination of grip and durability. If you want even more texture, apply a third coat. Sounds obvious, but hard-scrubbing traditional non-skid coatings can leave ugly dark specks where the silica particles wear through. TotalTread is easier to clean because it’s less abrasive. And because it’s more abrasion resistant, the only thing hard scrubbing does is make it look as good as the day it was applied. Like the texture but not the tint? Concocting your own color is easy. 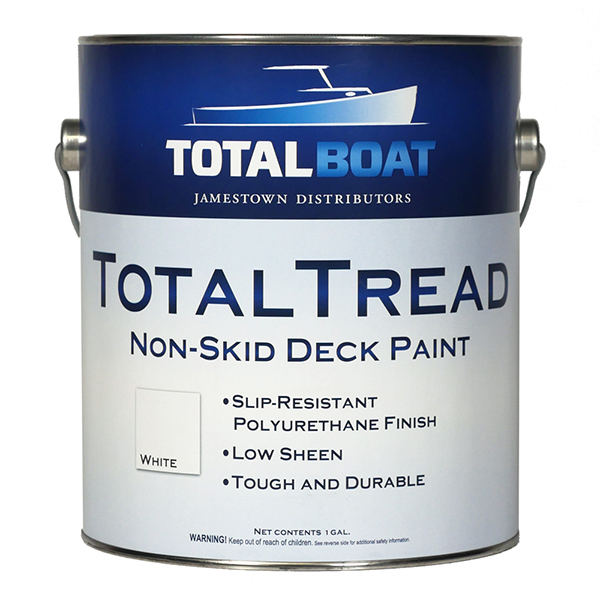 Just mix TotalTread colors, or blend a TotalTread color with a TotalBoat Wet Edge color. Use TotalTread where extra traction is needed, such as wooden stairs, steps, and docks.